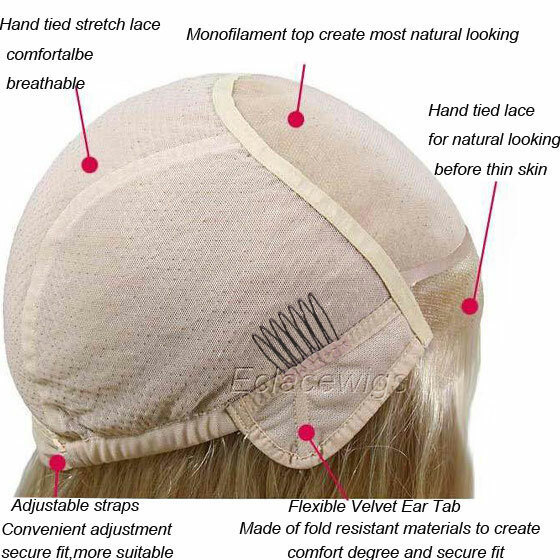 What is Cap Construction of Mono Top Lace Wigs? Everybody knows that Wigs can offer a new hairstyle or change looks without cutting or dying your own hair. They also help people with medical issues such as Alopecia and hair loss. The two most common types of wigs are the lace cap and the monofilament top, or mono top wig, a more natural looking wig. Mono top lace wigs are mainly made of human hair, and the price is higher than common lace wigs. Mono top lace wigs are wefted at back, meaning the root ends of hair are woven into three silk threads to form a weft. The weft is sewn into the wig cap. The spacing size of each weft depends on the quality of the wig. More expensive wigs have smaller wefts sewn closer together. A mono top lace wig has a micro-mesh lace insert beneath the cap, with individual strands of hair sewn in to make it look more natural.Please view picture of mono cap above. The hairline of mono top lace wigs has a sheer piece of lace with hand tied knots. The lace front is invisible to the eye and makes the hair appear to come straight out of the scalp. The knots are hand tied to avoid the look of even rows. Mono top lace wigs have a micro mesh lace insert that protects the scalp from scratchy knots made by wefting. This prevents irritation on the scalp and redness around the hairline. Mono top lace wigs come with four or five tape spots for added comfort. Tape spots are tabs inside the cap of the lace wig made from shiny plastic. You can attach double sided tape to the tabs to prevent the lace wig from moving or slipping then. Because of the natural appearance achieved with mono top lace wigs, they are often worn by women -- and some men -- who have lost their hair due to medical issues. Mono top lace wigs are often referred to as medical wigs, although anyone can wear them. Unlike wefted cap wigs, you can part mono top lace wigs anywhere you like. View previous：How to Correctly Measure a Full Lace Wig or Lace Front Wig Correctly if the Size is Big?